I keep no fresh eggs around so I chose to paint this one... it's semi-precious. Sort of like nearly-valuable. It's lovely. what about the frog? I found the frog when I was walking the dog. He's definitely non-valuable. ...Well he did add some visual interest to the painting so I guess he has a little value :).... that and I just really have a thing for frogs. 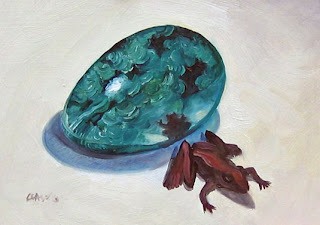 I like this little painting, it inspires me to paint some of the crystals and rocks I have laying around.